There are many variations to this fish and it has a reputation of being easy to keep. Unfortunately this has often led to its demise as they are sometimes kept in unsuitable tanks. As with any fish, they require optimum water conditions. The comet or comet-tailed goldfish is the most common variety of fancy goldfish in the United States. It is similar to the common goldfish, except slightly smaller and slimmer, and is mainly distinguished by its long deeply forked tail. Goldfish are peaceful fish. Comets should not be combined with fancy goldfish, as the fancy goldfish will have trouble competing for food. If goldfish are combined with other freshwater tropical fish, it is best to limit this to catfish. 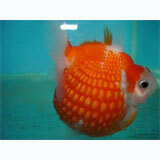 Fancy Goldfish can also be combined with danios, ottos, white clouds, barbs, kuhli loaches and weather loaches.